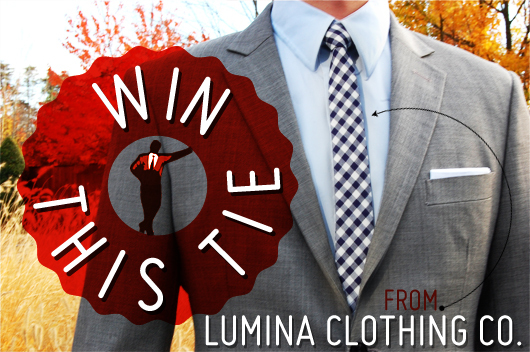 Let us help you look your best in the new year with a brand new tie from Raleigh based Lumina Clothing Co. Sorry gents, this contest has ended. Congrats to Primer subscriber Wayne Sung for winning! Keeping up with style trends can be hard–and expensive. For much of the past 40 years tie widths have remained fairly constant, always pushing upwards of 3 inches. And now, everyone (us included) is telling you all the neckwear you’ve got in your closet look like clown ties? Sure, you could have them tailored, but unless you’ve got a bunch of $100+ ties (we bet you don’t) the cost outweighs the benefit. So, since we’re the jerks telling you to get new ties, we figured we’d help out by giving one lucky Primer subscriber a gingham skinny tie from Lumina Clothing Co. This “Blue Streak” tie retails for $59 on Lumina Clothing's site, but you could get one for free! Lumina Clothing is a relative new comer on the scene, founded in 2008 as a bespoke neckwear company. They’ve grown and now maintain a collection of ready-to-order bow and neckties. Drawing from the local history of the textile industry in Raleigh, NC and creating as much in the area as possible, you shouldn’t be surprised by our support for another great small company producing goods right here in the USA. Being a Primer subscriber has its benefits. To enter to win this beautiful tie, sure to get kind words from ladies and gentlemen alike, all you have to do is enter the email address you used to subscribe to Primer in the form below. (That’s how we verify you’re a subscriber, we won’t do anything else with it or share it, honest.) If you're not a subscriber yet, click here, it's free! We'll draw one winner by random on January 4th. We use random.org to generate the random winner. That’s it! Best of luck, and here’s to looking your best in 2011! All entrants must be email subscribers to Primer and submit the same email address in the form above to enter. Winners will be announced next Tuesday on this page and via Twitter and Facebook. One random winner will be chosen by using the random number generator at random.org. I am a subscriber and your form isn’t displaying here. I am on Google Chrome browser running Windows Vista if that helps. Sorry about that Joshua! I think I found the problem. I’ve entered your information manually. Thanks for reading! Thanks for responding and it is displaying now. Thanks for entering my information and I don’t have to do anything do I? Thank you! Nope, you’re good, I’ve got you entered. Isn’t proper tie width also related to shoulder/chest size? Tie width is typically measured against lapel size, but you’re right, there are some bigger guys that may feel a skinny tie looks out of place or draws attention to how wide they are. In these cases I would stick with a 2.75″ inch tie. Skinny enough to be modern, but not too narrow to call attention. as a female, I appreciate a wider tie. I associate the width of a tie with the depth of a man’s wallets. Would you go to work on Wall St. with a skinny tie? Didn’t think so.